January Journal: Day 18 — Ginger writes. This is part four in a group of posts on memory work. Read on if you want the nitty-gritty. We left off yesterday with a discussion of review work and "repetition by hearing," during which time, Cash can often be found doing things like this. But soon it's time to move on to "repetition by seeing," where the kids can no longer be monkeys. I use two white boards so I can keep rotating between the two and have 6-8 verses written down at a time. Once we fill up both boards, I erase the earlier verses on the first board and it now becomes the second board for new verses. We go over the new verse we are working on a few times, with everybody looking at the board. We take turns reading it, or I read it and they repeat. Then we work on our memory tricks. It's very important to me that we know the transitions from verse to verse. This is a newer strategy we've employed after I noticed there were many places the kids were needing prompts. They would be good for a few verses once I prompted them, but they would soon get stuck again. I didn't want them to have to rely on me for a clue to start the next verse. We look at the previous verse we memorized (which is why the white boards are great in allowing us to see what came before), and then we look at the new verse we are working on. We try to make connections with the words themselves, or the letters the words start with, or any phrases that repeat, or anything else of this nature. I've heard that some people create pictures in their minds to represent certain words and then they make up stories for how the pictures connect. We occasionally try that if we can't think of another way to make connections with the grammar. But mostly the focus is on the ways the words and letters are laid out. You wouldn't believe how helpful this sort of thing is. Colossians 3:2 Set your mindson things that are above, not on things that are on earth. Colossians 3:3 For you have died, and your life is hidden with Christ in God. Colossians 3:4 When Christ who is your life appears, then you also will appear with him in glory. In these verses, I noticed that I kept wanting to say mind instead of minds, so I made sure to point out to the kids (and to myself) that minds is plural just like things is plural. We couldn't think of the best connection between verses 2 and 3, to get from earth to For, but we talked about how E and F are letters next to each other in the alphabet. To go from verse 3 to verse 4, we think with Christ followed by When Christ, and of course one of the kids pointed out the two forms of the word appear. There isn't always a great connector, so sometimes we just have to practice going from one verse to another. When we were working on Colossians 2:15-16, I felt like the best way to conquer the transition was to write verse 15 on the white board, followed by the word Therefore, which is the starting word of verse 16. Even though we weren't working on verse 16 yet, I wanted everyone to be solid on the fact that the next word after verse 15 was the word Therefore. It worked great! In actuality, a memory trick isn't always necessary. You really only have to look for these kinds of connectors or reminders when you realize you or your children are having trouble recalling what comes next. But for our family, it has proven to be a fun way to get the kids more involved by letting them look for clues. 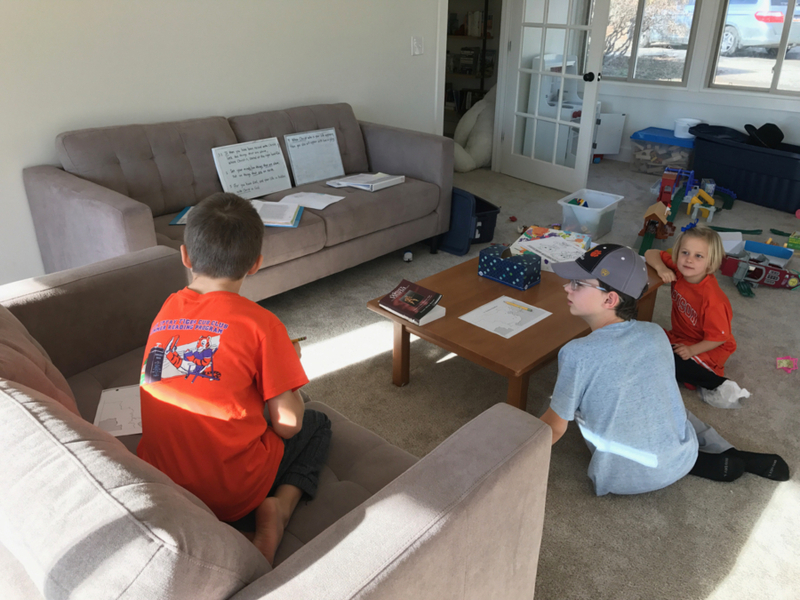 We work on our boards in the rec room, with everyone reading along (Story gets a pass on the reading part for now). After we've looked for clues, the boys generally jump to be first to try and say the verse without looking. Sometimes they can, but often they can't quite master it after one session, unless it's an unusually short verse. They love to try, though. After they make their attempts, we read the verse off the board again, or I say it and everyone repeats. This whole process of review and new takes us about 20 minutes, after which our morning practice time is complete. Just this week, we've started a separate poetry practice time, because I felt that it was getting too difficult to keep the poetry memory work mixed in with the Bible memory work. So today was our first "poetry and laundry" time. We spent 15 minutes folding laundry, reciting poetry, and then wrapping up with a quick review of the new Colossians verse we had worked on this morning. After this second session of memory work practice, the white boards are taken from the rec room to the boys' bathroom. They stay on the counter until our next morning memory session two days from now. The boys are expected to read over the new verses any time they brush their teeth or sit on the toilet. I remind them often, especially when they head upstairs at night to get ready for bed. If I'm in the their bathroom during the day and they are in their room, I make a point to read off the new verses for the kids to hear. There was a time when the kids seemed to mind that we practiced so much, but now I think everyone has accepted that it's just what we do. We review, we learn new, we make connections, we find clues. We review, we learn new, we make connections, we find clues. Yes, it's hard sometimes. Yes, we don't feel like it every single practice session. It's boring or redundant or hard to understand. But we do it because it's important (more on that on Friday). It's forming not only our memory muscles, but also our hearts and minds.